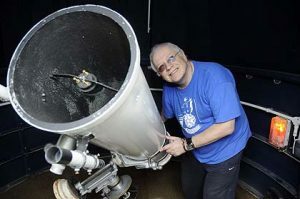 The Scarborough and District Astronomical Society was founded in 1976 by John Harper FRAS, its Honorary President. After meeting at the Osgodby Community Centre on the southern outskirts of Scarborough, it moved to the old North Riding College on Filey Road, then into the town’s library. Its present home is East Ayton Village Hall, four miles west of Scarborough. More recently the Society was renamed the Scarborough and Ryedale Astronomical Society (SARAS), to more accurately reflect the geographical area covered by its membership. 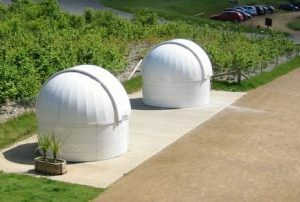 In 2001, SARAS established the Low Dalby Astronomy Centre in Low Dalby, Dalby Forest, in conjunction with the Forestry Commission. The aim was to take advantage of the dark skies which are perfect for astronomy and are considered amongst the darkest skies in the country. The partnership between SARAS and the Forestry Commission to promote dark sky astronomy in the forests was the first of its kind. Sir Patrick Moore FRAS opened the original facility in 2001. In 2008 the Astronomy Centre was re-sited to its current home outside the new Visitor Centre. It is from this site that the Society conducts its public observing events. 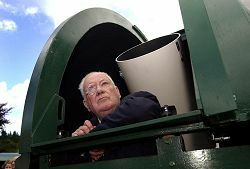 Members also have use of the observatories all year round.